so this last wednesday, i took a nice drive along the coastline to visit my dear friends jessica jane and valerie! i hadn't seen jessica and valerie since renegade los angeles and now that jess is living so close, we decided we needed to hang out. 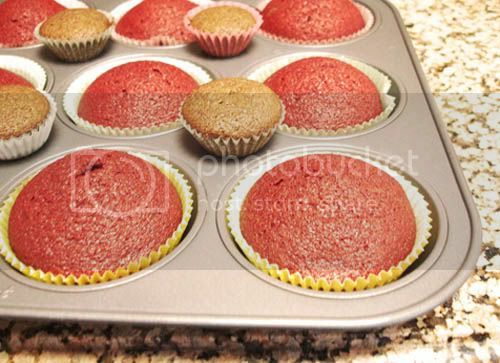 i've really been LOVING red velvet cupcakes since rubyellen gave me some so i asked jess if we could make red velvet. jessica posted about it on her blog too: so stop by her blog and see her lovely pics! okay. so to sum this awesome and pretty comical cupcake experience up: jessica and i went to henry's (an organic grocery store) to get the things we needed. they didn't have food coloring and we forgot the creme cheese for the frosting - which we asked valerie to bring over. so jess and i get a little desperate while we're waiting and decide we don't really care if they're red - they can be BROWN VELVET! so we make a batch of MINI cupcakes! lol. mm. it's just not the same as red. luckily valerie and her baby girl alina arrived to save the day! she had gel food coloring and it said 2 tablespoons but the tube was so tiny! so i put the whole tube of gel in, lol. they turned out really red, but i love it! then when we started making the frosting, jess realized she didn't have butter (to which she said, "how can i not have butter?!") so after seriously considering just making frosting without butter and debating on what it would taste like, i ended up running back to henry's to get butter. the recipe made SOO much frosting! we probably had double the frosting we needed. loved the raspberries on top. these are probably my 2 fav pictures of the day. i just like the way jess looks in the first one , holding her camera in one hand (we're such blog-nerds) and a cupcake in the other. the second one is totally candid cause alina stuck her tiny little hand in jess's cupcake as we were taking the picture. jess's face is classic. valerie and i are laughing and you can see little alina's hang with the frosting all over it, haha. and that is our cupcake friend gathering! jessica had a great idea that we're going to get together and make a new thing each time! can't wait for the next baking adventure. Yummy! Those cupcakes are making me drool. Excited to be a part of the Jill of All trades with you. :) See you in September! oh I like this! 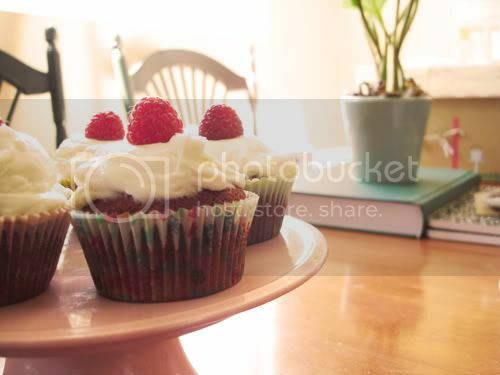 :) I really need to make those red velvet ones some time, they look so amazing. :) btw - I loved that you all put dresses on! 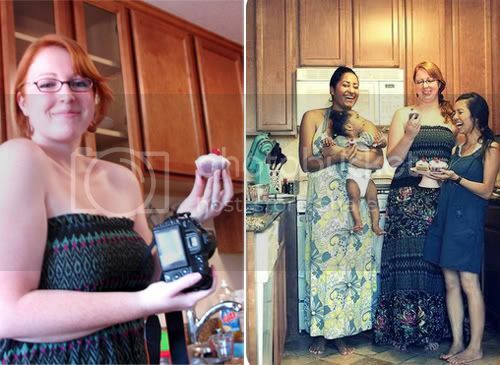 This is the best way to bond with girlfriends - over cupcakes! I sooooo love this! They look delish! Baking days with friends are one of my favorite things of all days ever. I'm a new reader but I thought I'd drop you a comment to say how much I've been enjoying your blog this week and how good those cupcakes look! Glad you all had such a great time. I love your blog! And those cupcakes look delicious! I like how the baby has a baby-sized cupcake. Haha! I believe you're in L.A. right? If so, you must go to Auntie Em's Kitchen in Eagle Rock. I used to work there, and trust me, they have THE BEST red velvet cupcakes in the city. I've tried many others, but none quite measured up. Red velvet is totally my favorite. The hubby doesn't like it, so it ensues heated debates at the store. hahaha. Looks like a fabulous and fun time! 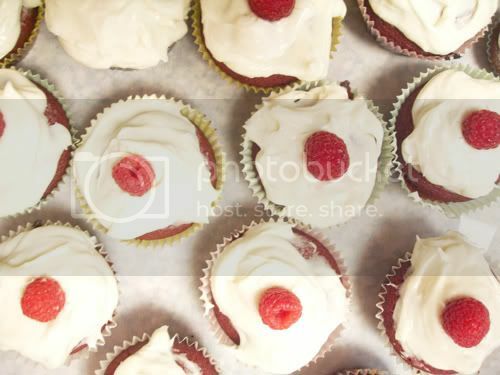 I always drown my red velvet cakes in a mountain of raspberries...I love that combination! oh my gosh, this post made me laugh out loud!!! 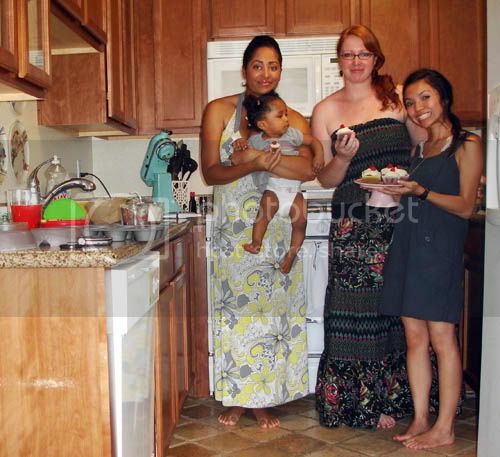 Look at Alina eyeballing my cupcake in the first photo of us!!! hahahaha. soooo funny. i cant wait for the next date. we should make something crazy. haha! Yay for friends and cupcakes!! thanks for putting right click back! but also... thank you for showing me the command click thing on the mac! it is sooooo helpful and i use it all the time now!! BTW LOVE your blog! keep up all the great inspiration! 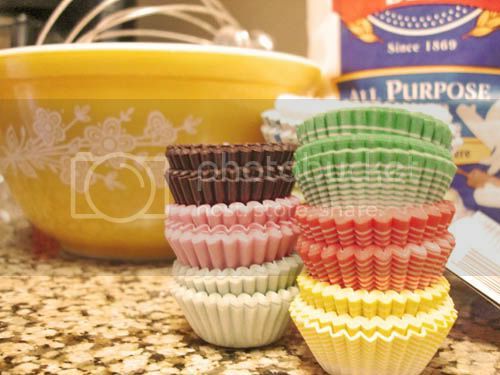 after seeing how much fun you guys had, I decided to make my own cupcakes, lol :) seriously, everything looks so yummy! 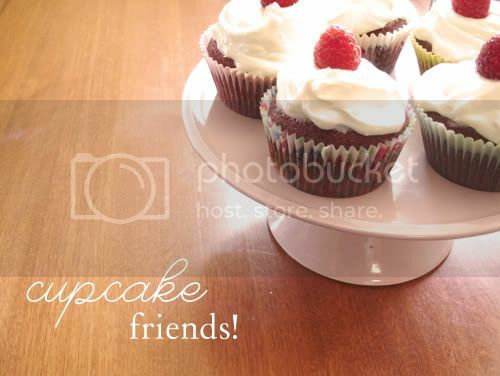 such a cute post - the cupcakes look yummy!